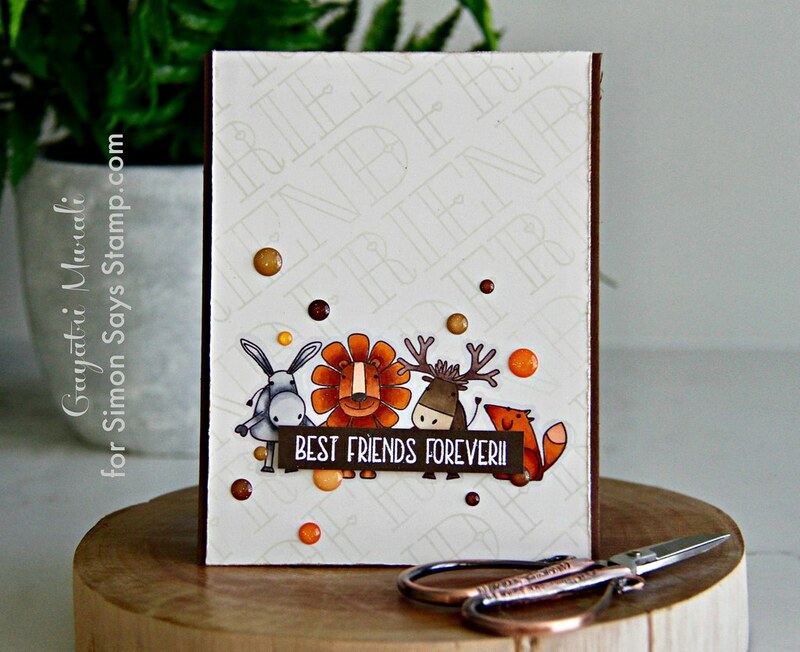 Sharing with you a cute card (in my opinion) using Simon Says Stamp Friends release stamp set. I am grateful to have sent couple of stamp sets from the release. But because of the holidays, they arrived only yesterday. The stamp sets were so adorable that I inked them up immediately and made my card. I have used two stamp set on my card. The first one is so cute with these cute critter images. This set is called Best Friends. On the background, I have used a sentiment stamp set from the release called Stained Glass Love stamp set. Here is how I made the card. 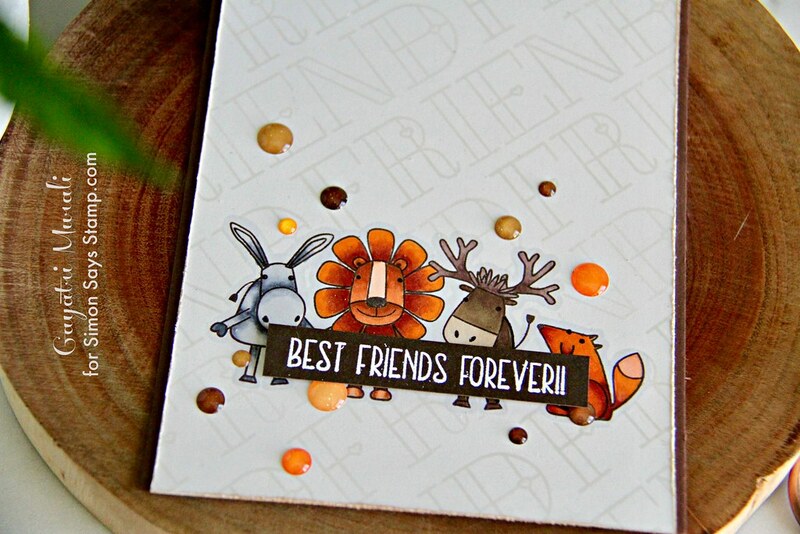 I used cream cardstock to stamp the critter cluster image from Best Friends stamp set using Chocolate Chip hybrid ink. This ink is great from copics as it is hybrid ink. I wanted something different from the normal black stamping. Also I wanted to use cream, beige, orange and brown combination on this card. So the Chocolate Chip hybrid ink from Taylored Expressions was perfect for stamping. I also stamped the same image on masking paper and hand cut out roughly the image and masked the stamped image on the panel. For the background, I used the Friend image from Stained Glass Love stamp set to stamp all over the background. I used Simon Says Stamp Barely Beige ink to stamp. This colour is soft yet noticeable on the background. Does not overpower the focal image. I removed the mask and copic coloured the images. How cute are those critters holding hands. 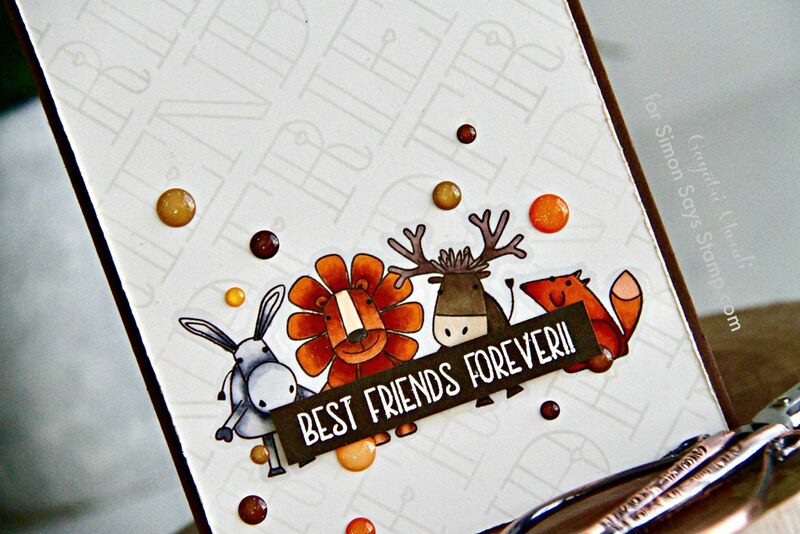 The sentiment is from Best Friend Stamp set which I white heat embossed on a strip of Chocolate cardstock. I trimmed the stamped panel on the side a bit, roughed the edges and adhered on a Chocolate card base. Love the chocolate card base showing on the sides which ties in with the sentiment strip adhered on top bottom of the coloured image using foam adhesives. Finally I embellished with Sprinkles glitter enamel dots from Doodlebug. All the supplies used to make this card are listed below. 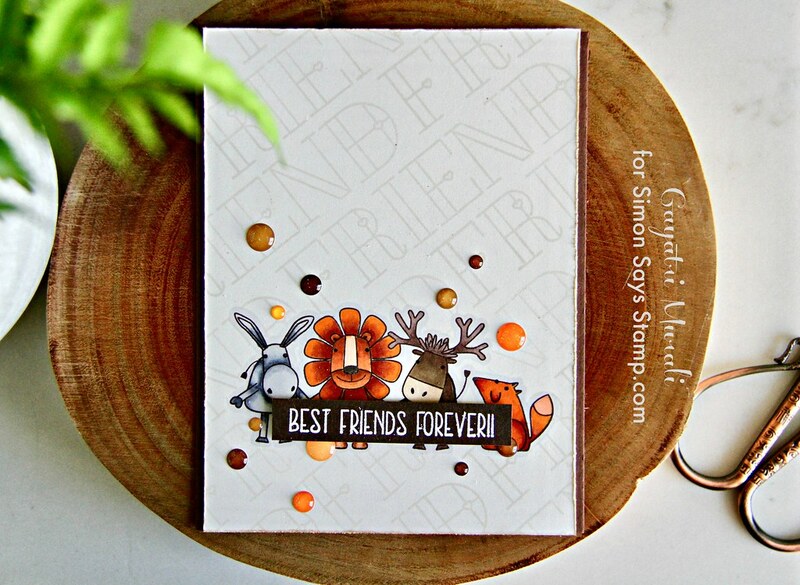 Best Friend stamp set is so adorable and coordinates really well with the Stained Glass Love stamp set. I cannot wait for my order to arrive. More goodies from the Friends release to play with and share. See you soon with more projects from the release. The background on this card is perfect! Looks amazing Gayatri, love your colouring!